Remember the book series Frog and Toad are Friends by Arnold Lobel? This is a wonderful collection of stories about friends who are a little different, yet are always there for each other. Well, frogs and toads are OUR friends, working with us in our gardens. 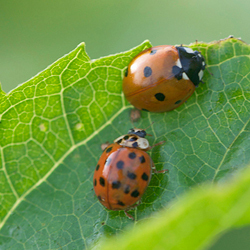 They help us keep our pest populations down, a great alternative to the use of pesticides. Just one frog or toad can eat up to 10,000 insect pests during the garden season, impressive indeed. (Ten thousand insect pests; do you think insecticides can even come close to that number?) Sometimes we are lucky and bring a little toad or two home with the plant we just purchased from the garden center. 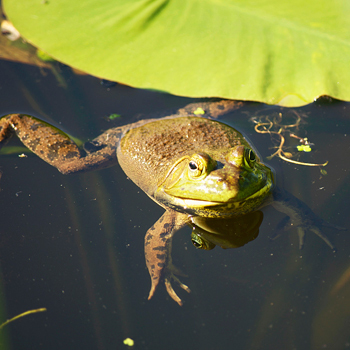 What are some other ways we can attract and encourage these amphibians to take up residence in our gardens? To see if you already have some toads, look for holes dug in your garden. 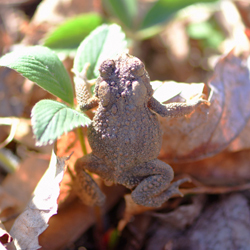 Toads, like voles will borough into the garden soil. But frogs and toads are not eating the roots of your plants, they are focusing on garden pests such as beetles, slugs and grubs, cutworms, caterpillars, and even grasshoppers to name a few of their favorites. Most frogs and toads are nocturnal, they want to avoid the sun which can dry out their skin. To encourage them in our gardens we want to provide shelter from the sun, and water for their ‘bath’. An arrangement of stones in a shady spot can create a cave for our friends, with a little garden mulch such as straw on top to keep it cool. Small clay or terra cotta pots turned on their side with a stone to hold the rim up a little creates an entrance and makes a nice toad habitat. Toads and frogs ‘drink’ by absorbing water through their skin so the saucer from a terra cotta pot can create a nice toad bath. Just like our bird baths, clean the toad baths frequently and be sure they don’t dry out. About midsummer, check this water source for the eggs or even tadpoles of our amphibian friends. If you are so lucky, continue to carefully keep the water clean in the toad bath. In New England, toads need to hibernate for the winter. They will dig into the loose soil of your garden to insulate themselves from freezing temperatures. Once last bit of advice, if you have dogs, be sure your garden is fenced. Frogs and toads do not like to be hunted by dogs. Whether you call it a garter, garden, gardener, or ribbon snake, these are small to medium-sized snakes in the genus Thamnophis. They populate forests, woodlands, fields, grasslands, lawns, and gardens. They grow to 18 to 24 inches in length. Males are smaller than females. When disturbed, they may coil and strike (non-venomous to humans) but are more likely to hide their head and flail their tail. The garter snake in my perennial bed seems to be used to my accidentally touching her, and just ignores me. Garter snakes diet is most important to gardeners. They love slugs, leeches, grubs, small rodents, earthworms, beetles, and unfortunately, even my other friends the frogs and toads. The red lily beetle population in my garden is low, and I think it is my garter-girl who deserves the credit. How to encourage a garter snake to live in your garden? They prefer moist areas with plenty of cover such as a perennial garden bed. Mine has made a home in the junction box for the night-time garden lights that is partially buried in the soil. You can make a similar habitat by placing a 6 inch terra cotta pot in the soil, buried up to its top. Place the lid upside down and slightly askew over the top of the pot so the snake can easily slid in and out. I would like to have another garter snake in my hosta bed to control the slugs, and will be trying out this method to encourage another helper in that shade garden. Yes, over 90% of all insects in our gardens are our friends. Some of them are our pollinators and some of them are the predators of other insects. We know that lady bugs eat mostly aphids, but we should learn to identify their larvae and eggs so that we don’t accidentally remove them. The larvae of the green lacewing insect feed on mites, insect eggs, and small insects such as aphids. Again learn what these garden friends look like so you don’t remove them. Predator wasps, such as the paper wasp prey on caterpillars and other insects. Some predator wasps lay their eggs on other caterpillars. Ground beetle adults look for and eat soil-dwelling insects such as cutworms and root maggots. Their larvae also live on the soil and in leaf litter feeding on any invertebrate. There are many, many more good insects, such as all types of spiders that will eat other insects. To encourage these good insects, we need to provide the plants that give them shelter, pollen, and nectar. Avoidance of pesticides is most important, because pesticides do not discriminate between good bugs and bad bugs. We recommend that you become acquainted with these insects through books such as Good Bug - Bad Bug by Jessica Walliser, and Peterson First Guides for Caterpillars, Insects. And yes, expect a little damage to some of your plants; Swallow Tail caterpillars love parsley, so plant a little more just for them. When you become familiar with the insect life in your garden you will be able to spot the eggs, larvae or caterpillars, and even the adults of the good ones, and find ways to eliminate the bad ones using alternatives to pesticides. Be sure to read our other feature article this month on Plant Health Care, and our previous article on Integrated Pest Management for some of these alternatives.